Seven days until Christmas. I am well ahead of my usual routine of waiting until Dec. 23. I purchased a number of gifts today. I’m not exactly the Grinch, I’m just not organized. Being late to the party isn’t necessarily negative. It clears the mind. Store shelves are somewhat empty so I don’t have to search through huge stacks of inventory. Husband wants houseslippers. Great. Sears was out. Target had one pair in his size . Thankfully. 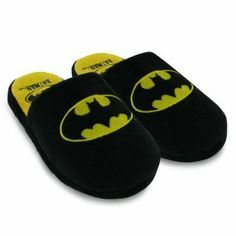 Or he would be getting Batman mules. The desired pajama pants were more difficult. He has to have pockets in his pajama bottoms. Our family refers to pajama bottoms as “fancy pants.” This name describes many of the p.j.s with cartoon characters or beer labels or some aspect of pop culture or sports. Nothing says romance like a man in a Mr. Bubble t-shirt and yellow Homer Simpson “Doh” pants. And there’s a rule. If he gets three new pairs of fancy pants, he must throw three pairs out. Even the Goodwill folks reject these wretched, ancient pants that he wears until there’s just the string and some colored flannel hanging off. Five days before Christmas. Now we’re getting down to the wire. With a busy week at work, my time is running out. Except for Amazon Prime. God love Amazon Prime. They’ll be there for me for two or three more days. Just in case. Over the weekend, I found my Beloved a new French press for his morning coffee. He’s broken three of the expensive Starbucks brand crafted by native Americans smoking peyote on a Washington State beach. This time I moved up to a Mr. Coffee brand at Target. High cotton for the morning ritual. He also requested packaging supplies for his Internet business. I purchased three large rolls of bubble wrap at Staples for him. A rhetorical question: does one WRAP bubble wrap when it is a gift? Add three pairs of inexpensive (really inexpensive), black, plastic, wraparound sunglasses to the mix. He loses them, he sits on them, they fly away. When we first married, I could get ten pairs for ninety-nine cents each at the Marathon station. Thirty-one years later, we’ve moved on up to the east side with four dollar sunglasses at the Dollar Store. One surprise: I ordered a Kindle Fire Stick for his TV from Amazon. He likes old movies, so that might be fun. Bring on the holidays, I am ready! No spoiler alert. Disclaimer: my Beloved does all the shopping, for our son, and for the rest of the family. He does all the cooking and most of the shopping for meals. He made me breakfast in bed this morning. He is a peach, a gem, and about the best partner a girl can have. He doesn’t often read my columns, so his holidays and my crass over-consumption for him won’t be revealed until Christmas when I hand him the Macy’s shopping bag filled with his unwrapped gifts.